Partner A completes AMRAP at Station 1 while Partner B runs 10 shuttle sprints. Then Partner B completes AMRAP at Station 1 while Partner A runs 10 shuttle sprints. Pick a weight that is challenging, heavier than you do for Nancy, but not something where you’ll need 3-4 sets to complete. Maybe two sets. Well, it’s not quite Christmas yet, but it might be time for a new monthly tradition of hardening up and slogging through a longer, lower intensity effort. Follow the movements to the tune of the song 12 days of Christmas. It’ll go like this . 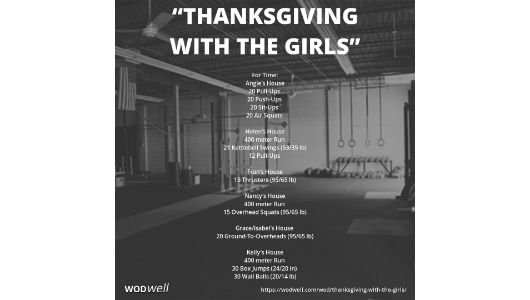 . .
CrossFit McComb - CrossFitThanksgiving with the Girls (Time)For Time Angie's House 20 Pull-Ups 20 Push-Ups 20 Sit-Ups 20 Air Squats Helen's House 400 meter Run 21 Kettlebell Swings (53/35 lb) 12 Pull-Ups Fran's House 15 Thrusters (95/65 lb) Nancy's House 400 meter Run 15 Overhead Squats (95/65 lb) Grace/Isabel's House 20 Ground-To-Overheads (95/65 lb) Kelly's House 400 meter Run 30 Box Jumps (24/20 in) 30 Wall Balls (20/14 lb) With a running clock complete all five named parts of the workout, with no rest in between. With a running clock complete all five named parts of the workout, with no rest in between. Both partners working at the same time on all movements. At 3, 2, 1, go… partners complete 5 partner deadlifts, then continue to burpees. Both partners working at the same time on burpees on either side of barbell (L/R offset), then advancing to the situps.